IMA’s 2018 school year is brimming with 40 tiny busybodies in little blue and red plaid uniforms. Our kindergarten program, which consists of four, five, and six year old girls, makes up a large portion of IMA’s student body. We are taking big steps to prepare our littles for a successful primary school career at IMA. Thanks to all of our current sponsors, we currently have 94 out of 143 girls at IMA partially or fully sponsored! 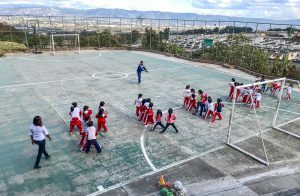 The kindergarten class at IMA participates in their physical education class. We are now campaigning to find sponsors for the almost 50 girls who are in need of funding. Sponsorship is the single most effective way to change a child’s life. By committing to the education of a student, not only do you ensure meals and classes for a girl living in poverty, but you are communicating to her that you believe in her future. Please join us in our campaign for 40. You can shareour posts on social media, talk with friends and encourage others to take on the education of a student at IMA. Together we can educate 40.